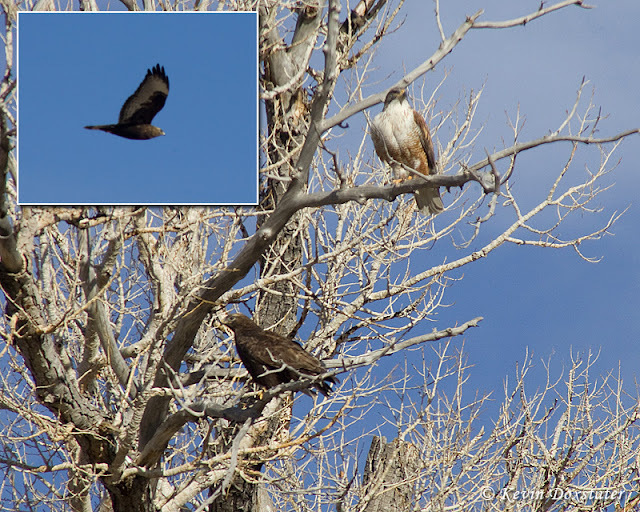 It is such a big difference living on one of southern Utah's High Plateaus (I live at 8,000 feet) when compared to my first several years watching and photographing birds in Florida. Birds are few and far between - around home I've seen about 8 species. To see much of anything, I have to travel, at least a little to lower elevations where birds are more abundant. That being said, I have a couple of things I try to do here each winter, and the first of my winter birding "traditions" is one discussed in last month's post, the Christmas Bird Count. Had a pretty good year this time, too, besting my previous high of 24 species with a tally of 29. The "best bird" of the count was a White-winged Dove - they're kind of rare in Utah and, in fact, the one we counted is only the second ever eBird record for Garfield County. 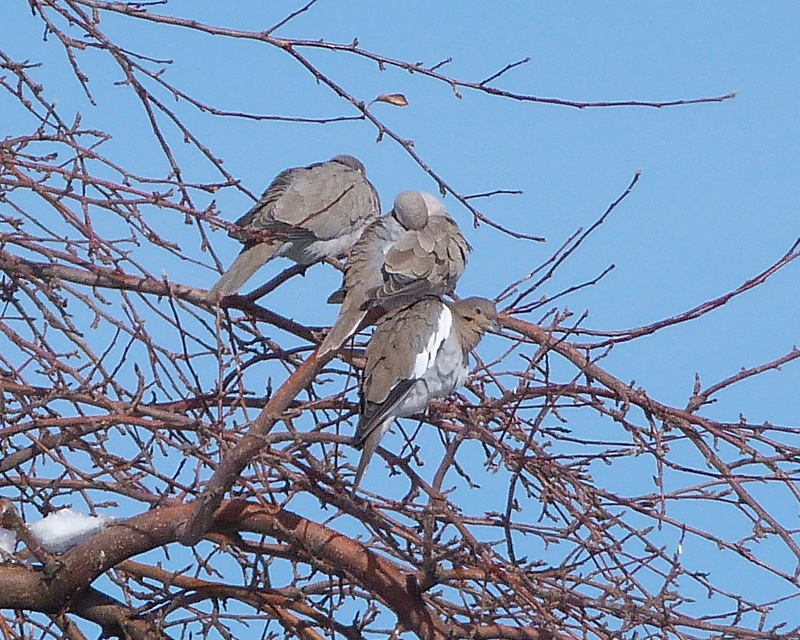 White-winged Dove with Eurasian Collared-doves in Tropic, UT. 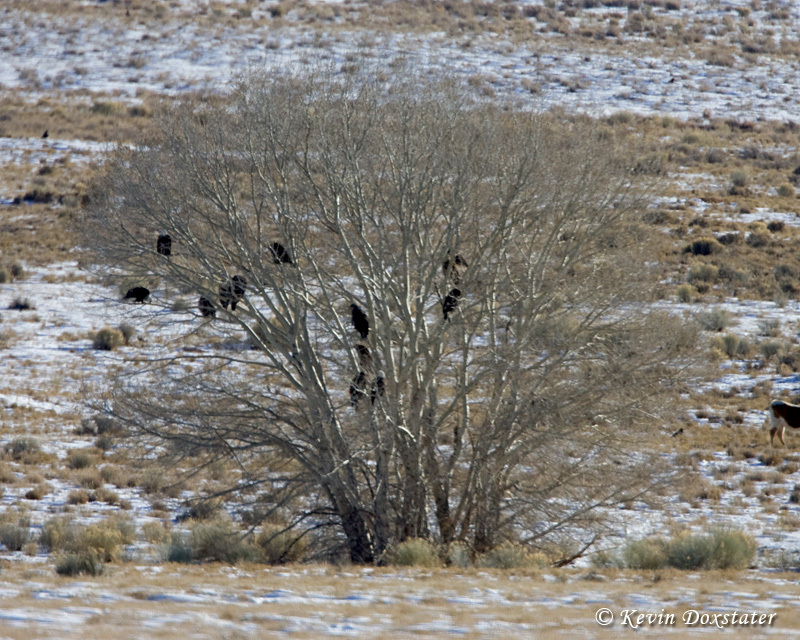 13 Bald Eagles sharing a tree in southern Utah. Bald Eagle - 2nd year plumage. Fast forward to this year and, just before Christmas, I stumbled across an area that I decided might be worthy of checking out once the New Year rolled around - and it turned out to be a pretty good morning looking for raptors. There's a little rural road that leads for several miles out of the small city of Panguitch, UT past cattle farms and lots of wide open spaces. Cottonwood trees line the Sevier River that flows on the east side of the road for a little way before the river meanders off to the west side. Traveling north the river is, eventually, nearly a mile away, but you can still pick out the big dark birds with white heads perched in the trees from that distance. I had a total of 15 for the morning along that route. I can't say for sure, but have heard that most of the Bald Eagles that winter here are from British Columbia and southeastern Alaska. Red-tailed Hawks are present all year and I spotted 3 of them on this day, one perched in a tree and a couple perched atop utility poles. And utility pole perches would be a common theme for most of the other hawks I would see. After the eagles, the next highest raptor species count, with a total of 6, was Rough-legged Hawks. 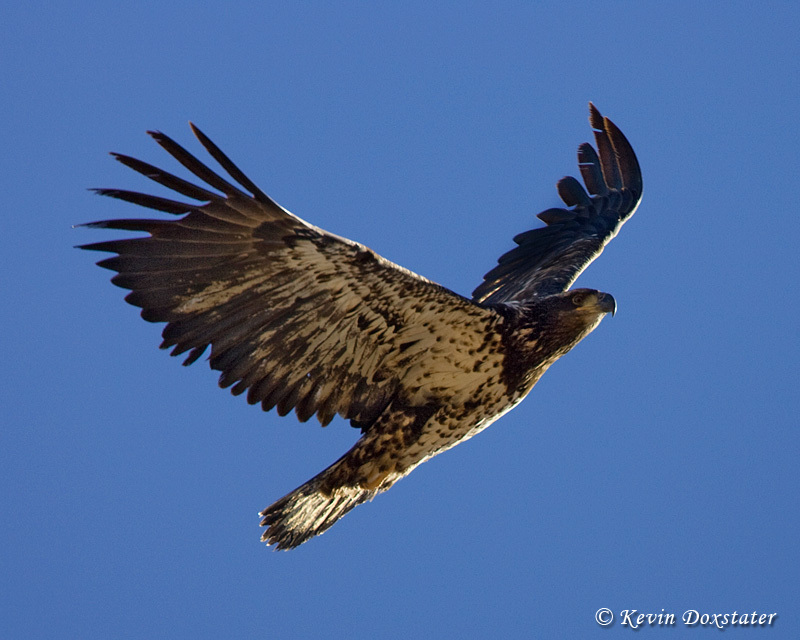 These birds nest in the arctic tundra, so have certainly traveled a long way to reach southern Utah. 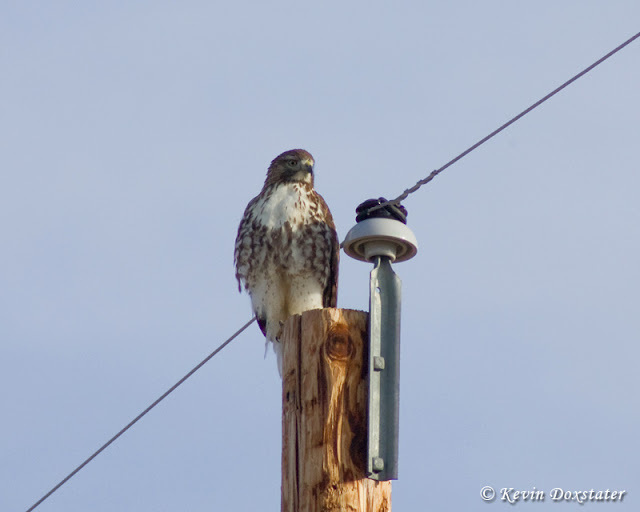 Below is another image of the same bird pictured above after it flew and landed on a different pole. 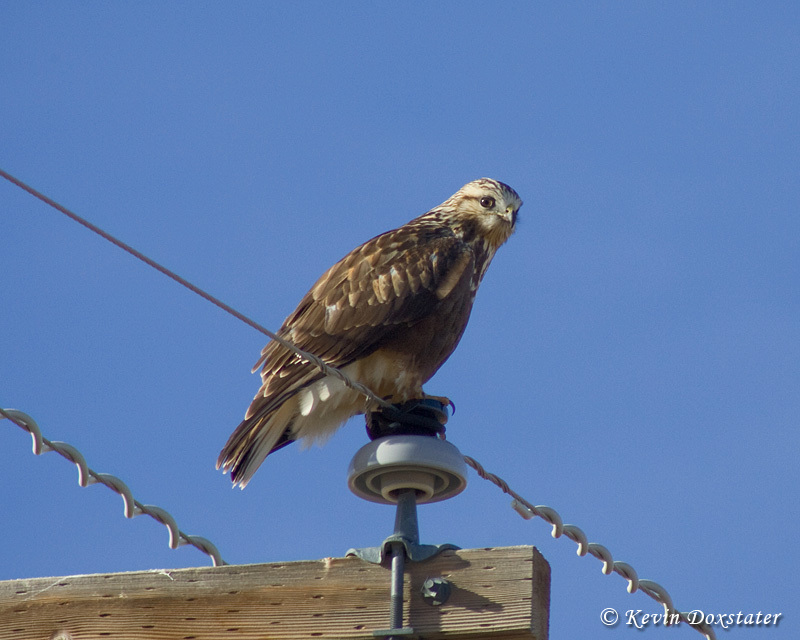 Considering the route was only 5 miles long, a count of 5 Ferruginous Hawks wasn't bad either. Without very many trees, but lots of pasture land that must have a fair numbers of rodents to keep the hawks fed, there sure aren't many opportunities to get photos of the birds on a nice perch. The Ferruginous pictured below is another immature specimen, also a light morph. These next two were found at my turnaround point sharing a tree and they left me a little confused initially. My first thought was that it must be a pair of Ferruginous Hawks, one dark morph and one light morph. I snapped a couple of photos of them in the tree, then grabbed my bins and field guide trying to decide what the dark bird actually was. As I wrestled with the ID of the dark bird it decided to fly away, so I quickly grabbed the camera and snapped off a couple of frames. I knew I wasn't close enough for a great flight shot, but had a feeling that a good look at wing pattern might be my best clue. I've inset one of those flight shots in the photo of them perched and, unless I'm missing something, it's a dark morph Rough-legged. I'm also thinking it's probably a male based upon the wing patterns of male and female dark morphs as painted in the Sibley Guide. For a 5 mile stretch of road, a total of 29 raptors isn't a bad haul at all - on average just a bit less than 6 raptors per mile! 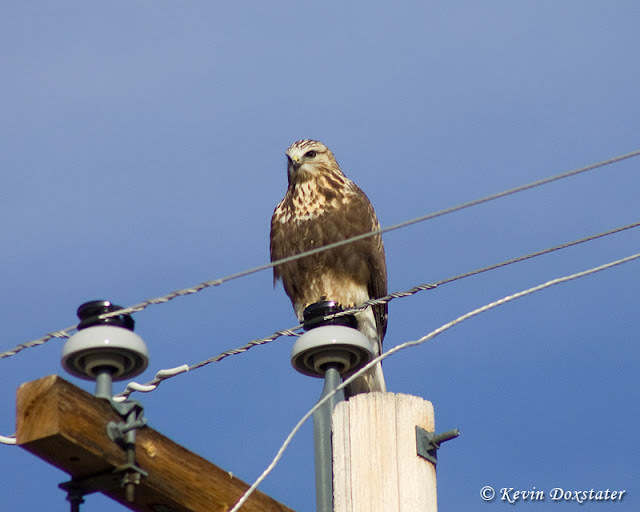 In addition to all of those, I saw a Golden Eagle and 2 other other Bald Eagles along the highway just a couple of miles before I turned onto my intended route. If there was any disappointment, it was not seeing any falcons - I've seen both Prairie Falcons and American Kestrels in that area in winter, but not on this day, unfortunately. I've got a pretty good idea where I'll be heading for my next New Year's Raptor Fest . 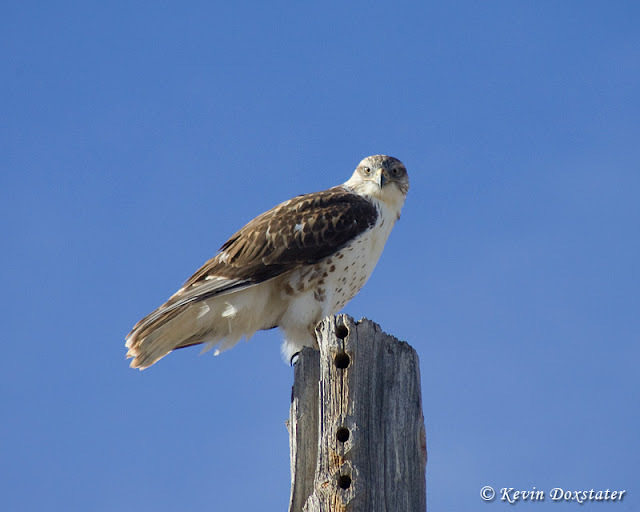 . . and if you're planning to visit southern Utah in winter and need to see some raptors, send me a note and I will be happy to give you directions. Wonderful post and photos Kevin, what a wonderful stretch of road that must have been. Wonderful photos Kevin, as usual. I've missed your posts very much. Happy you're a BIF contributor so that I can see something from you at least once a month! Nice to see you here Kevin~ Great post! Great post and wondeful images Kevin! Pretty Nice Raptor fest. I am glad there is someone out there in Garfield county eBirding! I've been through Panquitch before on my way to AZ from Layton, UT. I pulled off the road to count birds by a farm field one year and found some nice mountain bluebirds! Great shots. I like how you did the inset thing. Love seeing all these raptors you have down there Kevin. When I'm on road trips in your area during winter I have to be careful not to run off the road because I spend so much time looking for (and finding) them. Interesting post and nice photos. Thanks everyone for your kind comments! It was a great morning! @Ron & Kathiesbirds: It is a good area and I have to admit it's better to be a passenger traveling through there on Hwy 89 in the winter - there's too much to be looking for! @Linda: Someday soon I'll probably start blogging on my site again (but will still write for "Fun!") . . . Wonderful post Kevin! Hey on that last dark morph bird, did you rule out Harlan's Red-tailed Hawk? Robert - I considered it but in one of the other frames, though pretty fuzzy, I can see a more distinct and fairly broad black band at the end of the tail than I would expect on Harlan's. But I've been wrong before . . .
Wow, 29 raptors over a 5 mile stretch! Fantastic! I thoroughly enjoyed scrolling through this post, reading about your fine adventure and viewing the wonderful images. Simply beautiful pics. I'm hoping to make the transition from a keen observer of birds to a decent photographer of them. Thank goodness it doesn't cost a lot to cut your teeth before you spend the big bucks on professional equipment.